This entry was posted in Uncategorized and tagged Bad managers, Ben Stiller, Meet The Parents, Ontario Shores, Robert DeNiro. Bookmark the permalink. Unbelievable. Must be a very difficult work environment, now, for the staff. What does this say about our Mental Health care system? What else is endorsed at that workplace? Never mind the mental health of the “system” What about the mental health of the Manager??????????????? Boy, you’ve nailed that one head on! What kind of a workplace is this? Very disturbing, can sum it up to workplace bullying – SHAME!!! What? Is this for real? Isn’t this the old Whitby Psych Hospital? I am shocked. People used to talk about what a great place it was to work down there. What happened? Who is in charge of the place? Who do they answer to? I’ve heard some community gossip about how bad it is there now but had no idea that staff were subjected to this kind of abuse. Makes you worry about the care of the patients if this is how they treat staff. I hope outside agencies are paying attention to this and everyone connected to running that place should be thrown out. I agree with previous comments, I question the mental health of the manager that did this, think it is shameful and I thought bullying was against the law? One would think what other things are going array at Ontario Shores….things being slipped under the carpet so to speak….why do they feel that they must intimidate staff into submission….are we dealing with ” Fifty Shades” ? This just leads to the lack of support that workers are getting from their managers on even larger issues….violence against staff and workers lives being changed forever. Does management support them or dismiss them as damaged goods, and not taking responsibility for their lack of safety in the work place. This administration has forgotten that this is a mental health facility where the staff give the clients 100%….however this above blog. gives a clear indication that the upper management are incapable of managing a mental health facility if this is how they treat their staff. How in this day and age with all the anti-bullying campaigns, can this Manager still be employed at this Centre? Does no one there care what is happening to employees? Who is running the circus at this facility? Isn’t this worksite a so-called ‘Centre of Excellence?’ Sounds more like a Centre of Mediocrity. Such behavior is outrageous and shameful! Do new dietary employees have to view this clip as a condition of employment? We are extremely disappointed that the OPSEU Blog posted on September 11, 2012 omitted context and factual information regarding a staff meeting. One of the topics of the meeting was a broad conversation about building trust and improving relationships. The video was presented as an example of an inappropriate way to build trust. Other tools were also used to show ways to enhance trust and positively improve relationships. In no way was the video intended to “intimidate staff.” On the contrary, Ontario Shores and its leaders value respect and trust in the workplace and have a zero tolerance policy for harassment and bullying. All staff and managers receive Respect in the Workplace training and education. 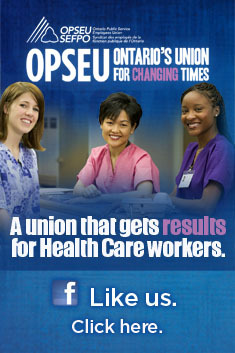 Ontario Shores remains committed to ongoing dialogue with OSPEU Local 331 on any and all matters of interest. Really, that is your retort. Seriously lame. And here you have it ladies and gentlemen! A fine example of how Ontario Shores does business. Regardless Ms. Marshall, I think you have missed the point. The video was shown at a staff meeting and it deeply offended the staff … so it might be in Ontario Shores best interest to explore why this video was offensive as opposed to blaming OPSEU for blogging about it. Oh … and y’all might want to consider offering a SINCERE apology to the staff who were forced to watch the video. But I can guarantee you, if a front line staff person ever DARED showed this video to co-workers, they would be gone from that organization so fast! And you would find Ms. Marshall’s response to be something along the lines of: “we don’t tolerate that kind of behaviour in our organization” …such hypocrites. Managers may need a little more respect in the workplace training if this is their idea of an instructional video. Not sure how this particularly video builds trust and relationships — it appears to have accomplished the opposite. Would like to respond to the Ontario Shores spin doctor. Or is it Dr. Spin? In what Mental Health world on what planet would anyone believe that the showing of this video clip was an “omission of context and factual information?” The video speaks volumes. And then to try to “spin” it into “an example of an inappropriate way to build trust” for redemption is beyond belief. Leads me to wonder how come if the intent of showing this clip was as Ms. Marshall would have you believe, to “enhance trust and positively improve relationships” just what was going on with the working relationship that ever required such a discussion at a staff meeting, much less treat staff akin to 5 year olds that needed a blatant example such as this video clip to demonstrate an “inappropriate way to build trust.” Ms. Marshall fails to elaborate but does mention “other tools.” Yep. “Tools” is right. Shame, Shame, Shame. What’s next, showing a movie clip of the Godfather, showing a horses head on the bed??? ?